Identify the hazards that can result from working in hot environments, including physical signs, symptoms, and treatments of heat stresses. Identify ways to protect yourself from heat stresses, including observing your employer’s heat stress protective strategies, along with other preparations and practices. Heat stroke is a serious side effect of heat stress, and attributes to at least 300 deaths per year. If you are exposed to heat in your work environment—and if you work outside it is likely that you will be—then the risk of heat stress illness and injury needs serious attention. Those most affected by heat stress are people working in outdoor conditions and it is easy to forget about those working indoors where there is insufficient building insulation, ventilation, or cooling, or with tasks where heat is generated or warm conditions are required. Of course the risk of working outdoors presents greater risk depending on the regional setting; in the American southwest, summer is simply hotter and the climate is more arid than in other parts of the country, so risk of heat stress is naturally greater. But it is important to be clear that heat stress can and does happen when working inside, for many occupations. It is critical that those who must work in extremely hot conditions understand the types of heat stress and ways to protect and prevent heat related illnesses and injuries. Heat stress can result in heat stroke, heat exhaustion, heat cramps, heat syncope, or heat rashes. Heat can also increase the risk of other injuries to workers as it may result in sweaty palms, which make gripping activities more difficult; fogged-up safety glasses make it hard to see clearly; dizziness can make working at heights dangerous; burns may also occur as a result of accidental contact with hot surfaces, steam or sunlight. Heat can exacerbate high-risk working conditions to another level. Let’s walk through the common effects of heat stress. Heat syncope describes a fainting episode or dizziness that occurs during activities in a hot environment. Factors that may contribute to heat syncope include dehydration and lack of acclimatization. Symptoms of heat syncope include light-headedness, dizziness, fainting, dry mouth, excessive thirst and sweating, headache and possibly nausea and vomiting. You should treat workers with heat syncope by having them sit or lie down in a cool place, slowly drink water, clear juices or sports beverages, and cool their body with tepid water. Heat cramps usually affect workers who sweat a lot during strenuous activity, like construction day laborers who use the entire body over the course of a day. Symptoms of heat cramps usually include muscle pain or spasms in the abdomen, arms, or legs. To treat heat cramps, first stop all activity and sit in a cool place. Then drink clear juice or a sports beverage, preferably one with electrolytes; the body is craving salt in these situations, which is why you may recognize the call for pickle juice as a remedy for muscle cramping. A heat rash is a skin irritation caused by excessive sweating during hot, humid weather. Heat rash will typically resolve in a few hours or days without medical treatment. 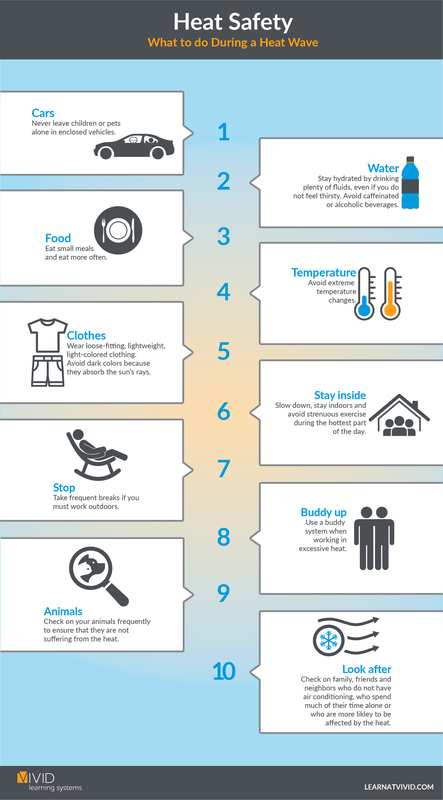 Employers can implement several actions that will protect workers from heat stress. First, schedule maintenance and repair jobs in hot areas for cooler months and particularly hot jobs for the cooler part of the day. During the hottest part of the day, plan work that can be done in shaded areas as much as possible. It’s a good idea to acclimatize workers by exposing them for progressively longer periods to hot work environments. Reduce the physical demands on workers, and use relief workers or assign extra workers for physically demanding jobs whenever possible. Provide cool water or liquids with electrolytes to workers. Be sure to avoid drinks with caffeine, alcohol, or large amounts of sugar, as these increase the rate of dehydration. Provide adequate rest periods, with water breaks, in cool areas. Provide for increased air cooling, if possible, through air conditioning or fans. Keep in mind that using fans will help cool the worker but can reduce awareness of the loss of fluids through sweating. In the heat, workers should wear light-colored, loose-fitting, breathable clothing, such as cotton, and avoid non-breathing synthetic clothing as much as possible. Remember that certain personal protective equipment (PPE) can add suffocating insulation that can compound heat stress through added physical exertion and resultant perspiration, in which case extra precautions must be taken. For example, hazmat suits or heavy welding gear may intensify the effects of direct exposure to full sun and high temperatures, not allow the body to breath or for natural air to provide circulation that makes sweating, a natural response to heat stress, effective.